Having been a wee while since our last update, we are happy to drop this 'hello' into your inbox now and fill you in on what's been going on. At this time of discussion around land reform in Scotland, we are working to push things forward through our response to the Scottish Parliament's consultation on the Land Reform (Scotland) Bill as well as making inputs into other aspects of the agenda flowing from the Land Reform Review Group report. Those in/around Skye on 7th Sept may wish to attend a public meeting being held by the RACCE Committee, at which we will be giving evidence. We are also representing our members as part of the Short Life Working Group which has been established by the Scottish Government on how to achieve the doubling of community owned land by 2020. Our membership is ever growing, and we would like to welcome new members Culbokie Community Trust, Keose Glebe Steering Group, Scourie Community Development Co. and Strathdearn Community Developments. See our website for details about our member communities and a map of the membership. Over 100 delegates attended our 5th Annual Conference held at Drumossie Hotel in Inverness at the end of May. We were pleased to welcome Dr. Aileen McLeod, Minister for Environment, Climate Change and Land Reform who delivered the keynote address. The conference also heard from Professor Jim Hunter, Sandra Holmes (HIE), Rob Gibson MSP and several of our member communities who were able to share their experiences. You can find copies of the conference papers on our Resources Page. We have been very actively involved in the passage of the recent Community Empowerment (Scotland) Act in the Scottish Parliament. A number of our amendments to the Bill were accepted or helped get commitments on the Parliamentary record, or secured further amended proposals from the Scottish Government. The Bill was approved just before the summer recess and is now an Act of the Scottish Parliament which has extended community land rights to seek the transfer of publicly owned land or buildings into community ownership. Our agenda now moves on to see what improvements can be secured in the new Land Reform (Scotland) Bill which is just starting its parliamentary scrutiny process. We are supportive of many of the provisions in the Bill, but think it can be improved and strengthened. We have recently submitted written evidence to the Parliament Committee dealing with the Bill and have been asked to give oral evidence to the Committee in September. Our submission points to a number of areas where the Bill could be improved. Keep an eye on our Jobs page to find out about vacancies within our membership. Barvas Estate Trust on the Isle of Lewis currently have two positions available. 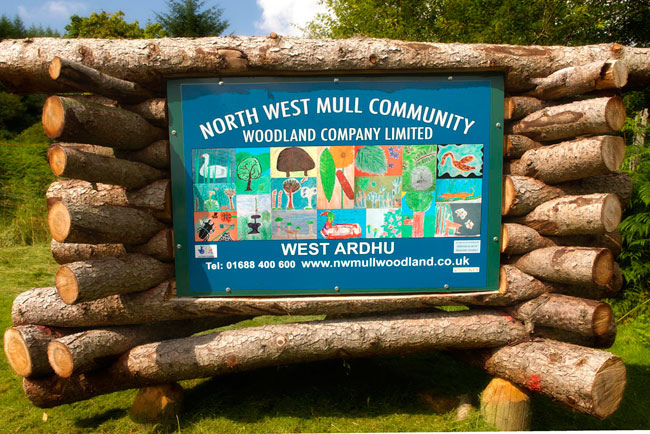 NWMCWC is a community company with charitable status set up to manage Langamull and West Ardhu woodlands in the North West of the Isle of Mull. These woodlands, which cover 675 hectares, were purchased through the National Forest Land Scheme from Forestry Commission Scotland in 2006. NWMCWC aim to manage the community land and associated assets for the benefit of the community and the public in general as an important part of the protection and sustainable development of Scotland’s natural environment. We have become members of the International Land Coalition (ILC) which seeks to support community land rights and land reform movements around the world. Peter's presentation Scotland: Winning progress in land reform and community land rights is available on our website. Our last AGM saw a bit of a changeover and we are happy to have one of our founding members, Lorne Macleod, as new Chairman of Community Land Scotland, while Mags McSporran (Isle of Gigha) and Margaret Nicolson (Urras Baile Fhlòdaigearraidh) were welcomed as new members onto the board. Ruth Cape, our former Development Officer, has returned from her travels and joins us again on a part time basis. Ruth will be managing our website & communications. See our website for full details of our board members and staff.